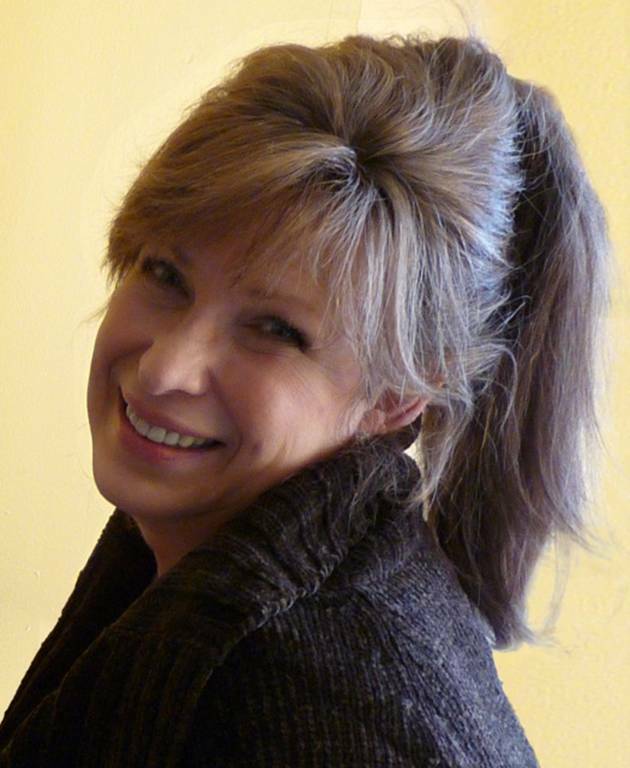 Personal interests: Reading, gardening, laughing with girlfriends, and the rescue of abandoned and abused animals. When I made the life-altering decision to leave my career in interior design in order to pursue my dream of writing a novel, I had the idealistic thought that I’d take my laptop to the local park and sit at a picnic table overlooking the Ohio River. I imagined my fingers would blaze over the keyboard for hours, and now and then I’d stop to watch a coal barge lumber its way toward West Virginia. Oh, the serenity of that image was burned into my mind and I couldn’t wait to make it a reality. But, I soon discovered that I was the kind of writer who needed to work at a desk. I live in a restored Queen Anne (circa 1902), and on the second floor I created what I call the writing library. The room isn’t very large, but it’s filled with bookshelves and artwork that I love, and it’s the perfect size for my needs. Set in an ashlar-cut stone bay are three windows that overlook the front gardens. Morning light floods into the room, and it has a fireplace that I keep burning throughout the winter. This is the room where I imagine, create, and dream. I’m happiest when I’m sitting at my desk in a totally quiet house, writing, researching, and developing characters and scenes. I do write quite a bit when I’m on location—as in when I visit Savannah or Charleston—bit it’s always back in the hotel room where the notes I’ve taken throughout the day are expanded upon and then worked into my manuscript. I tried writing scenes for Saving CeeCee Honeycutt while sitting in Forsyth Park, and again in Montgomery Square, but I was so distracted with people watching that it proved fruitless. So, back to the hotel room I went. I have a special totem that means a great deal to me. My great aunt Mildred had a powerful impact upon when I was a child. She was a true Southern lady who possessed great charm and wit. She lived in a big old Greek revival home that I fell in love with, and it was she who lit the fire I carry to this day. 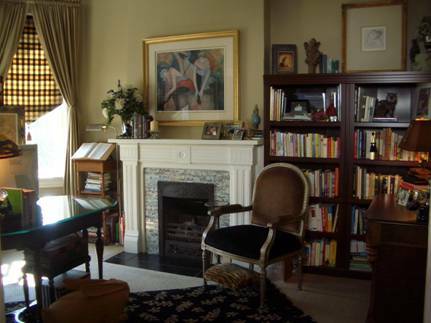 My great aunt introduced me to historical homes, antiques, and the power of the written word. In fact, the character of Tootie Caldwell in my novel is based upon my great aunt Mildred. One summer’s day I plucked a stone from her walkway and brought it home with me, and it has since become my totem. I keep it on the fireplace mantle and will oftentimes pick it up and hold it for a moment. 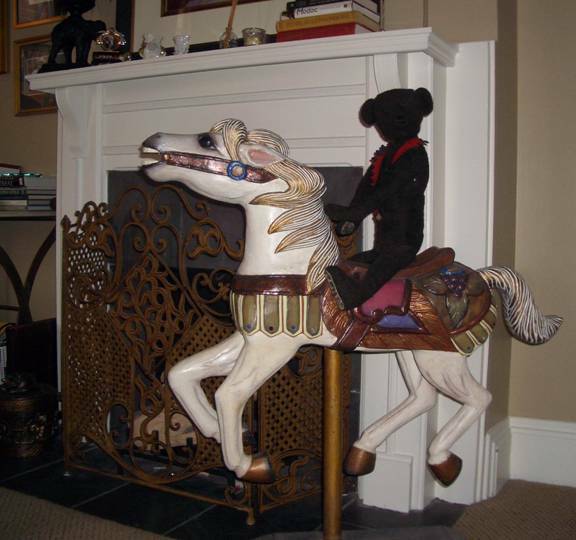 The other thing that I look at to help me stay grounded is a miniature antique carousel horse and teddy bear. From my desk I can peek around my computer screen and look into the den. By the fireplace sits these two happy creatures, and they always remind me to nurture a childlike spirit and not take things too seriously—the good or the bad. Anyone who has ever met me knows that I love animals, and when I work at home my furbabies are always with me. I enjoy their company, and sometimes I’ll read a passage I’ve just written out loud, and I swear they listen with great interest. Oreo, the tuxedo kitty shown below, gets right up on my lap and tries to help me write. And little Frankie likes to sit on the credenza behind me and watch the birds. Some writers like to have music playing in the background, but I’ve found that I work best in a totally quiet environment. 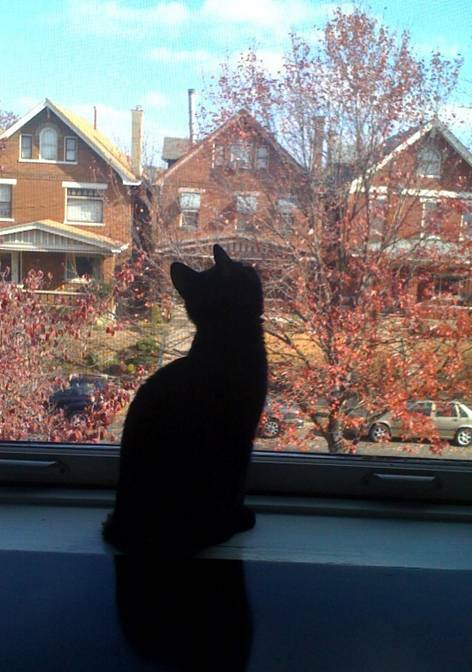 I do enjoy the occasional “Meow” and I never tire of the birdsongs especially those of the red-winged blackbirds. 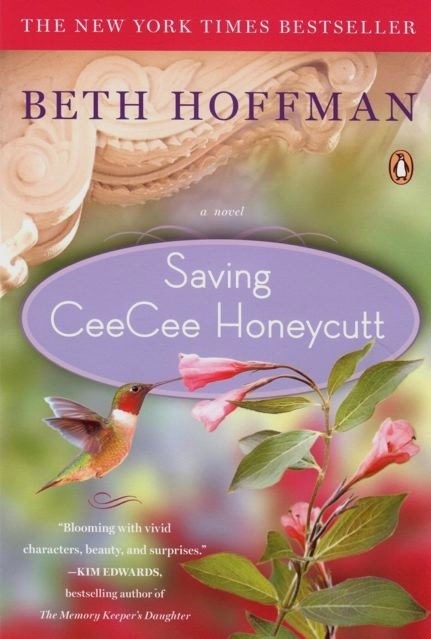 Beth Hoffman is the author of Saving CeeCee Honeycutt—a New York Times bestseller. Thanks so much for your kind words and also for inviting me to be a guest on your lovely blog, Kaye! My friend Nan has this funny thing she says which I've stolen. When she really really loves a book she says it's one to put back to take with her to the old folks' home (MANY years down the road, of course). 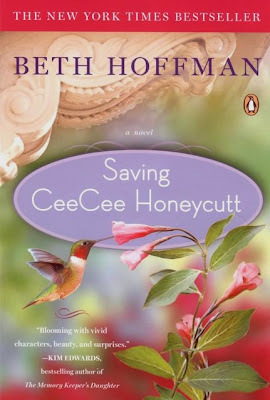 CeeCee Honeycut is definitely going to the old folks' home with me - I LOVE this book. It also has one of the most beautiful covers ever. thanks for being here, Beth - it means a lot. Two of my favorite people together, Beth and Kaye. It was a treat to read this Beth, and to see the furbabies. 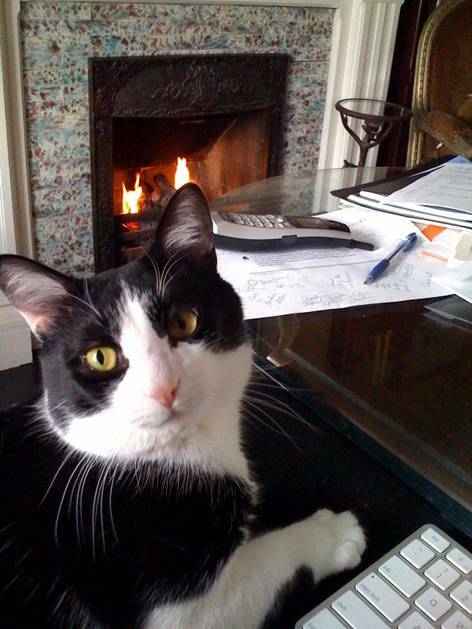 They're both adorable, but I really like the way Oreo assists you in the writing process. Hugs & wish I would have seen you in NYC! Kaye ... your friend Nan is someone I would like! I'm touched that CeeCee would be on your list to take to the old folks' home! Lesa ... so nice of you to stop by! I am in such fantastic company; with you and Kaye by my side, how could I do anything but smile? I love the room you write in. It would be next to impossible not to feel creative when sitting in a room so creatively designed. Thanks for sharing. Your writing space is gorgeous. I can well-imagine how it is conducive to work. I also agree that background music of birds singing is better than anything on the stereo (in these days of ipods, that word sounds so old fashioned. May as well call it a hi-fi). CeeCee Honeycut has been on my to buy list for a while. These M & M endorsements move it up the list. Thank you for stopping by, Brenda. I hope you enjoy CeeCee's adventures!